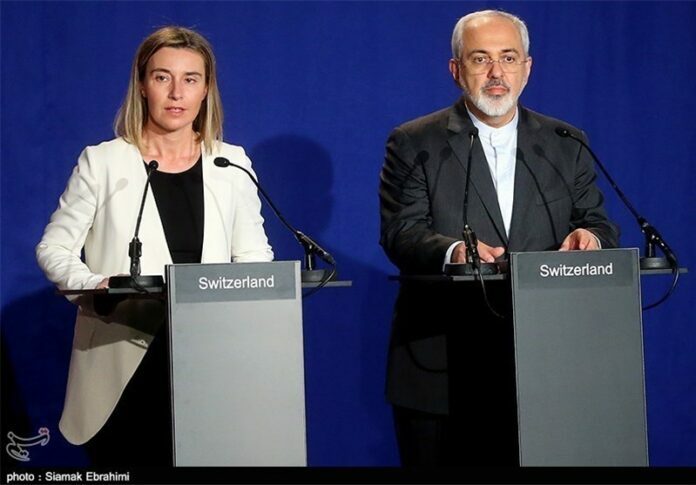 Iranian Foreign Minister Mohammad Javad Zarif has written a letter to EU High Representative for Foreign Affairs and Security Policy Federica Mogherini about the implementation of the lasting nuclear deal between Iran and six world powers, an EU spokesperson said. “The HRVP (Mogherini) did receive a letter from FM Zarif prior to the Ministerial meeting held in NY,” the spokesperson said, responding to a question by Tasnim about Zarif’s letter. The meeting between representatives from Iran and the Group 5+1 (Russia, China, the US, Britain, France and Germany), held in New York on the sidelines of the UN General Assembly session. The EU foreign policy chief was tasked with liaising with Iran on behalf of the Group 5+1 in the course of nuclear talks that stretched for some two years. While the 159-page nuclear agreement came into force in January, some Iranian officials complain about the other party’s failure to fully implement the accord.